The article in Kuensel “No child to be left behind” dated August 16, 2010 gives us some hope for our children as well as us the concerned citizens. Dagana education officials in close coordination with the local leaders promise to have 100% school enrollment by 2013. The move is to confirm if the children whose census are in Dagana Dzongkhag are already enrolled in school elsewhere and to call them back home if they are not in school. The Dzongkhag aims to enroll them in schools with some kind of kidu support. What a wonderful initiative by the Dzongkhag education officials! This should go a long way in setting example for others and hopefully achieve us the status of child labor free country. In Bhutan, on one hand there is an international pressure to protect our innocent children from exploitation and exploitive labor, and on the other there is the harsh reality of stinking poverty, to which Bhutan’s child labor finds its source. In a cruel world, survival far outweighs exploitation. There is no doubt that these parents love their children and better still want to send them to school. Why don’t we understand that? But out of choice-less choice, they let their children work. But in Bhutan, it is rare to find small children working in factories or deep mines. In Bhutan, baby-sitter and housemaids are the most common. This is where poor villagers send their young sons and daughters (mostly girls) to urban areas. If parents are unable to send their children to school and with the starving family, the only option is involve their children in some gainful activity. Just being a party to some UN Conventions and being complacent about the core issue is a useless attempt. This is because right now we are just saying we should stop it because it is reflected so in this or that section of an international law. Well, we can totally stop child labor in Bhutan if the law is enforced strictly, but what do we do next? Who is going to feed them? Who is going to rightfully educate them? It leaves us with more complex questions. We need to have certain mechanism, whereby we can help and support those poverty stricken parents find their ways. Right now we seem to be only making vague remarks - in Mr. Dorji Wangchuk's word "lip service". This is where initiative the likes of Dagana Dzongkhag education office seem to hit the nail on the right spot or at least somewhere near. There is the promise (100% school enrollment by 2013) and the practicality (through some kidu fund) of acting on the promise. It sounds achievable too – less movement of the jaws and more actions. 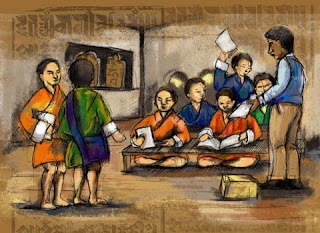 Whether we can turn everything right in just a little less than three and half years, something we have not been able in decades, is for us to judge, but it definitely should send right message to rest of the 19 Dzongkhag Education officials and local leaders in 205 gewogs. I love Napoloen but i love Bhutanese too. After all ..The dream we dream but the destiny that awaits us in reality is always undug..... I am for you. It would be great if you submitted your blog at http://bhutanblogs.com it's a directory of Bhutan blogs and journals. Hoping to see your blog in our directory.